Selling a house around the holidays can be a difficult task for your clients. There's a traditional assumption that this is when the market slows down. Despite that, many real estate agents earn more by capitalizing on less inventory to drive demand for buyers who truly are looking to move before the new year. Don't assume that homes won't sell this time of year. They can—if you know how to do it right. Check out our list of dos and don'ts so that you can help your clients have a stress-free real estate open house this holiday season. 1. DO: Shovel the walk. If your clients live in a cold climate, make sure the walkways and stairs are free of ice and snow. This will not only give your home a more polished look, but it will also ensure the safety of potential buyers. If you don't already carry a shovel in your car this time of year, it might be helpful to travel with one in case your client doesn't have proper snow-removing tools. A bag of salt can go a long way, too! 2. DO: Heat the house. Make sure the thermostat is turned up when it's time for the open house. 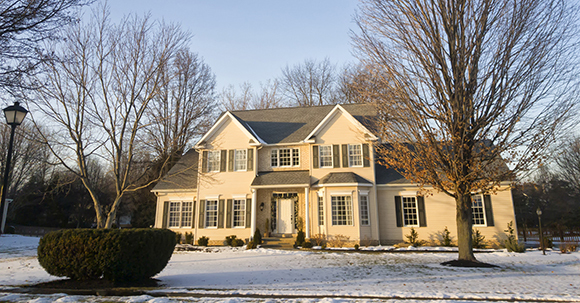 If buyers are uncomfortable from the cold, they are less likely to enjoy their visit. It's good to advise your clients of this before the open house starts so the house has time to warm up if they typically keep the thermostat low. 3. DO: Track the weather. If the weather outside is frightful, it may be best to reschedule the open house. Make sure to keep an eye on the forecast in case of any storms coming your way. 4. DO: Get into the spirit of the season. Put on some soft classical music and offer some homemade holiday cookies, hot cocoa and other snacks that can encourage prospective buyers to take shelter from the cold. A nice pot of spices boiling on the stove doesn't hurt, either! Add orange peels, cloves, cinnamon sticks and nutmeg on the stove to simmer with some water for a homey, delightful scent. 5. DO: Deck the halls. Take advantage of the holiday season by encouraging sellers to incorporate holiday decor into their open house. Twinkling Christmas lights or a scented holiday candle can welcome buyers and lift spirits. 6. DO: Write a powerful listing description. Listing descriptions these days are more than just point form lists—you need a powerful listing description! You want to engage your clients to feel excited about the home, especially about what the joy of purchasing a new home during the holidays will mean for them. Try to capture the excitement of the holidays to drive interest. 7. DO: Build a snowman. Nothing says "Welcome to your new house" more than a Frosty in the front yard ready to greet potential buyers. If the snow is wet enough to make a snowman, why not take advantage of the season? 1. DON'T: Overdo the holiday spirit. Though holiday decorations may create a cozier atmosphere in the home, you don't want to overdo it. Anything that may distract from the home's curb appeal—Santa and Rudolph inflatables, for example—should be put away until after the showing. 2. DON'T: Forget to declutter. Try not to go overboard and keep clutter to a minimum. Put away personal items, such as family photos, as they tend to distract potential buyers. 3. DON'T: Emphasize religion too heavily. There are many religions who celebrate this time of year. Going overboard on religious symbols can be off-putting to some, so remind your clients keep it tasteful despite their personal convictions. 4. DON'T: Leave presents out in the open. 'Tis the season of giving, but not to potential buyers. Make sure you pack expensive gifts and treasures away. Not only do many presents clutter the home, but they can be awkwardly personal for a new family trying to imagine their own future memories in the home. The bottom line is, the work doesn't stop just because the holidays are here! Use this time of year to brighten your open houses and not as an excuse to give up. Some buyers are specifically looking to purchase this time of year, and you might have just the property for them. Find more tips on hosting and marketing your open house and how to write a powerful real estate listing description. A special thanks to Liz Recchia, real estate broker/owner, for contributing her best practices for this blog post.